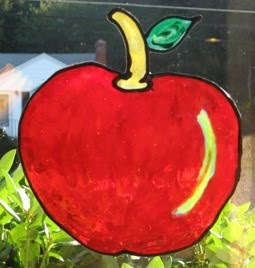 Did you know that with special paints you can make your own custom window clings? Several different companies make the paints but the two that I have used are Liquid Rainbow paints by Deco Art and Gallery Glass by Plaid. The Liquid Rainbow paints are more watery which allows them to blend more naturally. When they dry they are more translucent than the Gallery Glass paint. 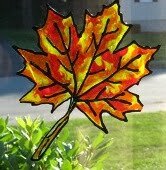 You will also need a bottle of leading paint and a styrene blank to make window clings. Choose a picture that is not too complicated and place it under the styrene blank. Then, trace the pattern directly onto the styrene blank using the leading paint. The leading paint has to dry for one to two hours. Once dry it creates a barrier which contains each color of paint. It is very important to be sure each line connects completely to another line or to itself so that the paint will be contained while it is wet. If there is any gap in your outline, the paint will flow out of your design. Use your Liquid Rainbow or Gallery Glass paint colors to fill in your design. Do NOT shake the paint or you will have lots of air bubbles. Hold the tip of the bottle just above the surface and gently squeeze the paint into the area you want to fill moving the tip side to side. It is important that you fill the outlined areas with the paint until the paint is level with the leading. Also, be sure the area is completely filled and there are no gaps between the leading and the paint as this will create holes in your finished project. The look of the paint changes dramatically as it dries. You can find complete instructions and more tips at Craft Elf. You can make window clings for any holiday or occasion. We have a graduation coming up soon so I will be making some graduation hats and diplomas. For a birthday you can make a hat or cupcake. Use your imagination!